Anyone who knows me also knows that have an obsession for stamping and for JEWELRY! I have enjoyed participating in a variety of challenges this summer and am now offering my own weekly Jewelry Color Inspiration Challenge that will be posted each Sunday. This challenge will include a jewelry photo and a link to the website where I found it. If you want to play along, simply make a paper project (card, scrapbook page, or 3D item) that includes the colors indicated with the jewelry piece. Then, submit your creation to me by posting a comment by Saturday, Oct. 4th at 11:59 P.M. and including the link to your project. You may also post your photo at Splitcoaststampers.com using the keyword JCI. This week's Jewelry Color Inspiration #5 comes from an unknown source. I saved this photo a few weeks ago from a website and now I can't locate where it came from. If I come across it again, I'll let you all know. 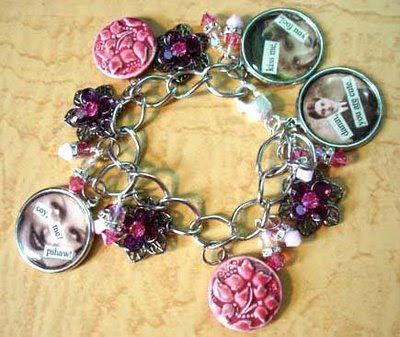 Don't you just love this vintage-style charm bracelet? To further inspire you, here is my Boho For You card, which I put together in a snap! This layout is one of my "old standbys" and works with a variety of stamp sets and patterned paper. 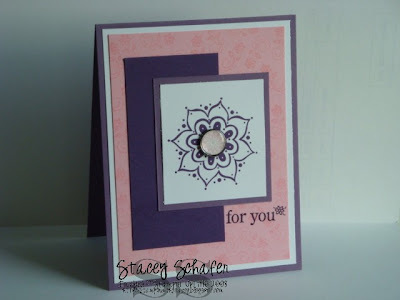 Notice here that I created my own patterned paper with the Boho Backgrounds stamp set on the Pretty in Pink cardstock. Purple and pink Yeah! These are my favorite colors. Hopefully I will get a chance to make something with these colors later in the week. I really like the way this card turned out. I tried to pick up some elements from the bracelet and incorporate it in the card -- like the Metal Edge Tags. Hope you like it! I made my card without checking your blog so mine is all purple. Maybe later in the week I will make a card that follows your challenge.